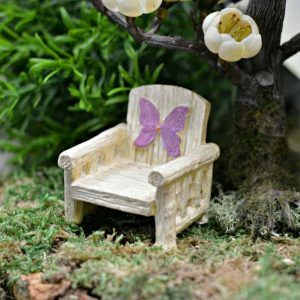 Solar fairy houses have become increasingly popular over the last 3 years. As night falls and the lights switch on, it reminds us of our family members arriving home each evening. The empty house is suddenly filled with childrens laughter, a mothers cooking, a fathers story-telling. The warm glow in the windows inspires pictures of a fairy family, gathering for a meal and sharing their adventures. 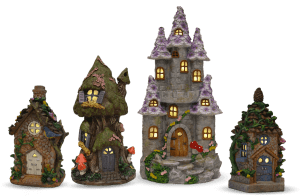 Lighting is particularly effective in fairy gardens and the introduction of solar fairy houses into the Australia marketplace a few years ago was instantly successful. 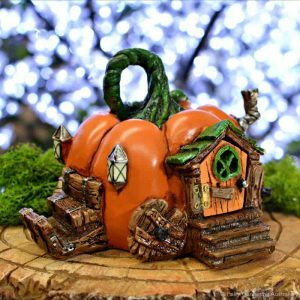 However, we have found ourselves offering product care advice that appears to conflict with the product use instructions of the solar fairy houses. 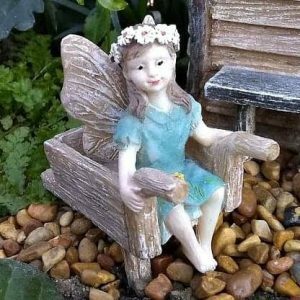 Fairy gardeners have been around forever. 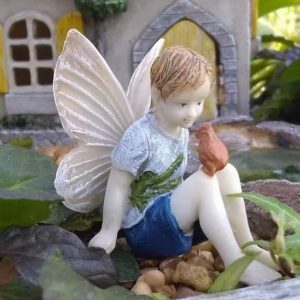 Generations of people have been creating little landscapes and enjoying the company of the fae. 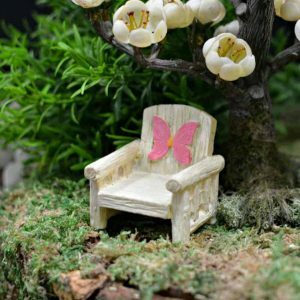 In the early 1980’s, developments in polymer resin, agglomerate stone and casting techniques saw a dramatic change in the way ornaments and collectibles were manufacturered. Cold casting and injection molding techniques opened an oportunity for large scale production of ornaments with fine detailing. This opened the door for fairy garden ornament manufacture. The US market warmly welcomed these new products and Europe followed. 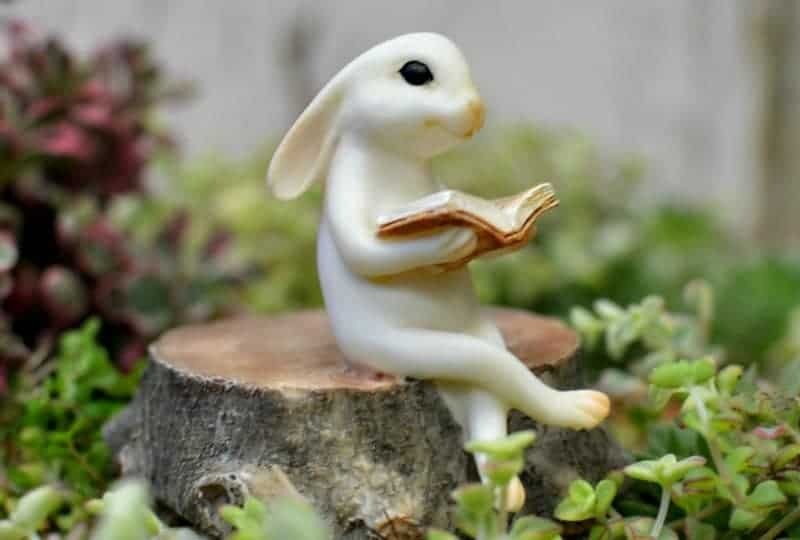 Australia was late to the mass produced fairy garden ornament game, but its late arrival did nothing to deter the Australian public from embracing it with open arms. While the products were used with success in the US and Europe, they had not been tested in Australian conditions. We quickly realised this and begun field testing. Product designs and colours were initially limited to darker, earthy tones so we commissioned a small run of products in a vibrant purple. Our initial test results lead us to immediately publish care guidelines. Further testing allowed us to refine those guidelines. Our findings: Prolonged exposure to UV radiation had an adverse effect on the painted surface. This effect was able to be controlled and limited by reducing exposure. Application of liquid polyurethane products at regular intervals was found to further limit adverse effects, however, it was ineffective as a stand alone method of UV protection. The care guidelines that we developed can be found here. The timeline of light bulb invention is a facsinating read if you are into that kinda thing, however lets skip it and get straight to the point. LED’s (light-emitting diode) came along and changed the world. They are cheap to manufacture, small and able to emit light in a particular direction which meant they didnt need reflectors and diffusers. Simultaneously, solar panels were getting better and smaller. One amazing day (it might have been a Wednesday), some bright spark combined the two and we were intoduced to the wonders of solar powered garden lights. A brilliant invention by anyones standards! Of course, the leap to solar powered fairy houses was inevitable from that point, and this is were we hit a wall. Because, in our little corner of the world, the very thing that powers the light is the same thing that deteriorates the product that it is contained within. That puts us into a bit of a pickle. 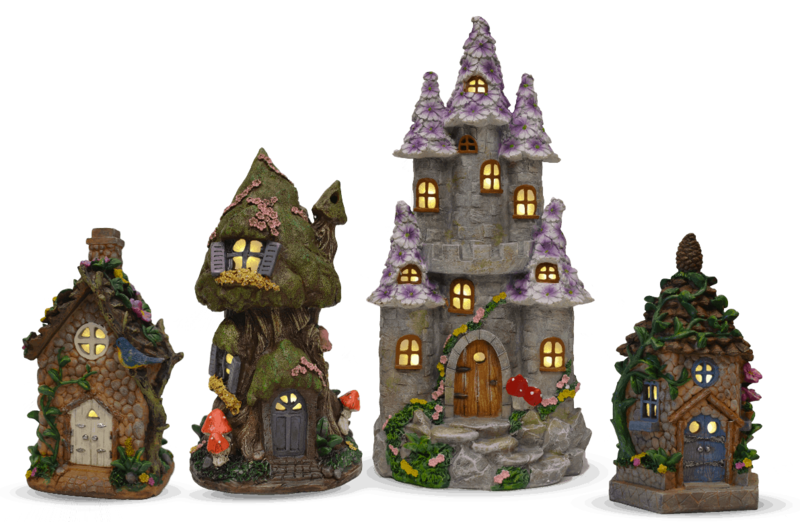 We initially delayed the introduction of solar fairy houses to our range. However, in the real world businesses survive by listening to their customers, and we began stocking them. Their loveliness is not in dispute here, we love twinkly things and the dazzeling array of designs and colours in the range. Here is the thing about care instructions: people usually read them after their products are damaged from not reading them in the first place. I stand by our product care guide and the advice contained within it is solid. I also stand by our customers and their right to make informed choices. 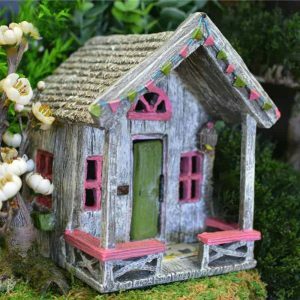 If you wish to position your solar fairy house in a shaded area that will protect its facade, then it may get enough sunlight to shine bright for a short time each evening and your heart will be filled with the warmest fuzzies for a lifetime. 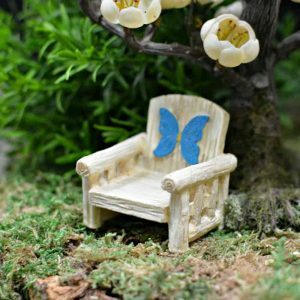 A temporary battery is included in your fairy house. Please replace with a new battery prior to use. STEP 1. Set the switch to the “OFF” position. STEP 2. Charge the solar product by placing it under direct sunlight for at least 8 hours. STEP 3. Change the switch to the “ON” position. 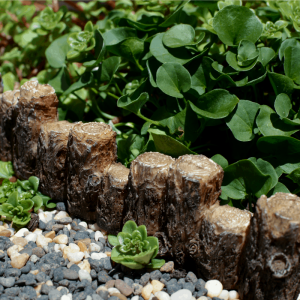 It will now charge automatically under direct sunlight during the day and illuminate at night. NOTE: In order to verify that the switch is in the “ON” position correctly, cover the solar panel with your hand and check that the light comes on. Place the solar product in an area where it will be exposed to direct sunlight. Select an outdoor location away from other light sources such as street lights and security lights. They may stop the product from lighting up automatically at night. Duration of light will vary depending on the amount of sunshine the item is exposed to, geographical location, weather conditions and the hours of daylight. Designed to go outside, will weather rain, but do not let the item sit in water, this may damage the product. If the solar product does not light up, replace the rechargeable battery as it may be weak or worn out. This product uses one “AA” 1.2V 600mAh Ni-Cd battery. When replacing, you must replace with a battery of identical specification. Open the battery compartment cover and replace the battery with the recommended equivalent only. Be sure to observe the correct polarity. CAUTION: Do not pull the lid off all the way or wiring may break. Open gently so as not to damage the circuit board or wiring. Close the lid back and make sure it is properly sealed. SHARP POINT WARNING: Use caution when handing this product. Part of the product contains sharp points. INSERT THE BATTERIES INTO COMPARTMENT ACCORDING TO THE CORRECT POLARITY SYMBOLS (+/-). TO AVOID EXPLOSION OR LEAK, DO NOT EXPOSE THE PRODUCT AND BATTERY TO FIRE. IF THE ITEM WILL NOT BE USED FOR A LONG PERIOD OF TIME, REMOVE THE BATTERY AND STORE IT IN A COOL AND DRY PLACE. EXHAUSTED BATTERIES SHOULD BE REMOVED FROM ITEM. Tell me more about your shop! Take me to the inspiration gallery! I love toadstools. Can I see some? 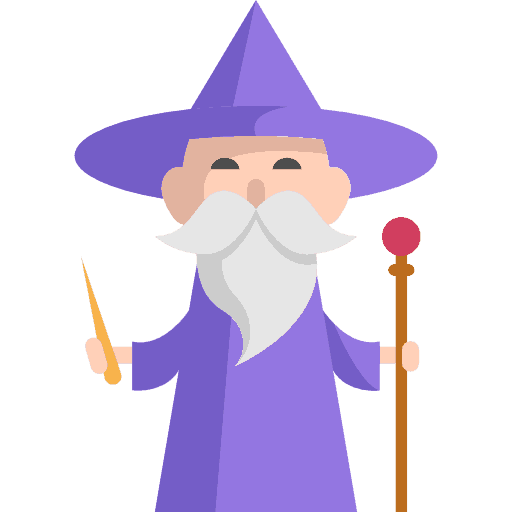 Show me a dancing wizard!